No one really wants to be placed into a position where they must defend themselves. Even people who are highly trained in self-defense techniques would prefer to not be fighting for their lives because an attacker has targeted them. When the news cycles are filled with stories of violence, it can feel like the whole world is against you. Whenever a shooting takes place in the United States, for example, there is a spike in firearm sales. The laws which govern how, when, and where you use a gun can be quite extensive in some communities. You will also be required submit personal information for a background check when buying a gun and potentially pass a skills test to obtain a concealed carry permit. The cost of this process, including the hundreds of dollars for the firearm, can put self-defense out of reach for many households. When you choose the best self-defense weapons that are not a gun, however, many of the rules and regulations are eased. For the price of a dinner out with the family, you can purchase an effective self-defense tool that can keep you safer should the unthinkable occur. You’ve got several options available to you if you want to carry a self-defense tool, but don’t want to carry a gun. Some options give you the ability to create a blunt force injury. Knives are included in this category. You’ll also find defensive sprays, keychain defense tools, and innovative products that can keep you safer. This chart offers you the chance to explore today’s top-rated options that are currently available. Why Choose to Not Carry a Gun for Self or Home Defense? There is no question that a gun can be an effective self-defense weapon. A firearm offers instant stopping power. It can be used at a distance or used in tight quarters. Just displaying a gun to defend yourself can often make an attacker stop what they are doing. There are also three very good reasons why many are choosing not to carry a gun for self-defense today. You must be able to prove that there was a threat to your life or the potential of serious injury or death to others. There is a legal framework that will be implemented when a gun is used for self-defense. There is the possibility that using a gun against an innocent person creates a problem that you must live with for the rest of your life. When you fire a gun, there is the possibility of striking an innocent bystander and this may cause legal or civil consequences after the fact. Being licensed and trained to use a firearm can make you an effective member of society, protecting yourself, your family, and your community from the bad guys that might be out there right now. If you’re ready to take on that responsibility, then go for it. For many people, they choose not to carry a gun because they feel like the rewards of doing so do not outweigh the risks. That’s where the best self-defense weapons that aren’t guns make for a good investment. What is the best self-defense weapon? The answer to that question depends on what you’re comfortable carrying with you, what your budget happens to be, and what type of environment you typically find yourself being in daily. For many people the best weapon is going to be a defensive spray. That means using a pepper spray or a Mace-branded product. 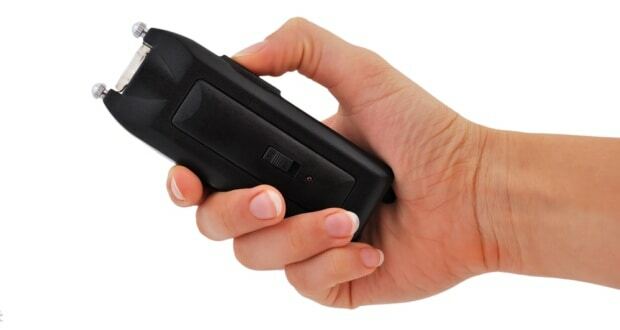 There are several benefits to consider when using pepper spray as a self-defense option. Because it is classified as non-lethal, you can generally spray it first and then ask questions later. It is easy to purchase. It doesn’t take much training to know how to use it effectively. It can give you an advantage over virtually any attacker. Some pepper spray containers give you the ability to disperse the product to 20 feet. That will allow you to get the defensive spray into the eyes and face of an attacker while reducing the chances of exposing yourself to the spray at the same time. If you are in environments where an attacker is more likely to be within 3 feet of you, then a bladed self-defense tool is a better option. Tactical knives, keychain knives, and other small blades can even be more lethal than a gun at such a close distance. For general purposes, a keychain self-defense tool is also effective. Trying to find your keys puts you into a vulnerable position that allows an attacker to gain an advantage over you. If you have a self-defense tool on your keychain and you are proactive about taking your keys out before you reach your vehicle or home, then you’ll have an effective way to protect yourself. Keychain self-defense tools are good for those who find themselves in parking garages, isolated areas, or public spaces that have a bustling environment. Be sure to review our guide to defending yourself legally to explore what your local obligations happen to be with a self-defense tool. Most states in the US have laws which restrict the type, amount, or size of the self-defense tool that you’re able to use. Here are some examples. In the State of Iowa, it is illegal to own a ballistic knife. There are also limits to the concealed carry of knives, but no limits to open carry. In the State of California, it is illegal to carry a container of pepper spray that is above 2.5 ounces in size. Some cities have unique laws that must be followed in addition to the state or national laws which may govern weapon possession. 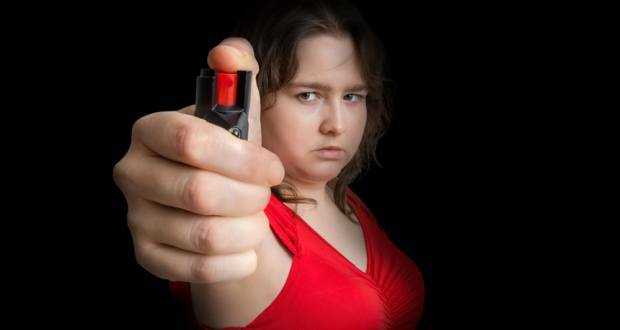 In Illinois, it is legal to purchase and carry pepper spray if the buyer is 18 years of age or older. In Chicago, however, it is illegal to purchase or carry pepper spray. Even if you bring it into the city, you could be held legally liable for carrying the self-defense spray. If you’re caught in a tough situation, you might not have one of the best self-defense weapons that aren’t a gun in your possession. Don’t despair. There are numerous options still available to you that could serve as an impromptu weapon that can stop an attacker. Crowbars. Consider carrying a crowbar in the back of your vehicle. Not only can it help you out if you need to change a flat or do some emergency repairs on a roadside, but it can give you another self-defense option. Air Horns.The noise from an air horn will make anyone jump because it is such a loud and unexpected sound. It is just as loud as a keychain panic alarm and will draw immediate attention to you, wherever you happen to be. Monkey Fists. This is a keychain that is made from a paracord and ball bearings. Wrap it around your fist or palm and then strike an attacker with it. Virtually anything that is around you right now can be turned into a self-defense tool. Picture frames have glass that can become a dagger. A coffee mug can provide a blunt force impact. Glass bottles can give you the benefits of both. If you’re surrounded by stuffed animals, you still have a shield that can be used to stop an attack so you have time to get away. Keep your wits. Evaluate your situation. Be proactive. This will help you stay safe, no matter what self-defense tools are at your disposal. Self-defense weapons are one of the most affordable investments you can make to protect yourself. The total cost to consider will depend on the type of weapon that is being purchased. Bladed defensive weapons, such as a tactical knife, may cost several hundred dollars. You may also find that small, easily concealable blades, can be purchased for less than $30 right now. Pepper sprays are priced on the strength of the of the product and the size of the container. For a small 2.5-ounce container, expect to pay between $15-$30 for the product. Double that price if you’re wanting a high-pressure delivery method. If you purchase pepper sprays in bulk, you can receive a good discount. Some companies produce defensive sprays at a rate of $60 per gallon. Keychain defensive tools include blunt force weapons, bladed weapons, and panic alarms. The cost of the tool depends on the quality, size, and type desired. Panic alarms tend to be the cheapest, with many priced below $15. Bladed weapons tend to be the most expensive, with pricing in the $30-$50 range in many cases. Blunt force weapons for a keychain tend to be priced between the other two. 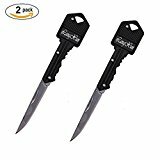 This keychain folding pocket knife gives you two fast self-defense options for the price of one. It’s a nice bladed product that is quite lightweight, with the entire product weighing less than an ounce. It features a lock back design so the blade won’t accidentally deploy while you’re driving. It’s sharp enough to be used for camping but versatile enough to work in the kitchen. When in the locked position, it looks just like a key. When extended, you have a 2-inch blade to help you get free. This is a unique little self-defense product that can attach to anything you own that has a strap. Put it onto your shoelaces or the back of your snapback cap and you’ll have a fast and effective self-defense weapon. It will also work with most watch bands. These aluminum discs have super sharp spikes that can inflict a surprising amount of damage, supplementing your physical force so that you can get away. If you’re concerned about an up-close attack, these scary sharp discs are a good counter option to have on your person. At 142 decibels, this is one of the loudest panic alarm warnings that is available in today’s market. On a calm day, the sound from this whistle can be heard from over two miles away. The design of this whistle is lightweight and has an omni-directional output. If you suspect an attacker might be headed your way, use this whistle and everyone around is going to know that you need some help. It will even work underwater if you have such a need. This self-defense cane comes with all the features you’d want from a helpful self-defense product. It even does a good job functioning as a cane if you need to use one. A flashlight is included with this model and there’s a stun gun that offers a 1-million-volt charge that will flatten any attacker that might come your way. It does have a 250-pound weight limit for its use as a cane and is adjustable from 32-36 inches, but there is no limit to the amount of protection that this helpful tool can provide. Sometimes the traditional self-defense options remain the best. You just can’t go wrong with a solid baseball bat if you need to protect yourself. 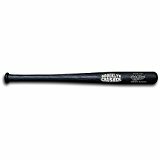 The Brooklyn Crusher is a virtually indestructible polypropylene bat that has the same weight and feel of a traditional baseball bat, but with a solid impact that can withstand almost any weather condition. It was built to replace a wooden baseball bat for the game, but the self-defense applications cannot be ignored. And, if you make a mess, you can wipe it clean with soap and water. It’s a good size, is nice and heavy, and would be perfect by the front door. Sometimes a big self-defense weapon is the best answer. Then there are times when a small weapon is your best choice. This titanium cassette toothpick proves that you can get big damage from a small item. It fits nicely in the palm of the hand and has a very sharp end that will cause intense pain when placed into an attacker’s soft tissues. Aim for the groin or the eye and you’ll be able to get away fast and easy because of the sheer amount of damage this item can cause. Or, if you prefer, you can pick your teeth with it. Many keychain self-defense tools are based on providing you with a blade or a loud noise as a way to defend yourself. Sometimes, however, your best option is to create a blunt force impact. That’s what this titanium triangle keychain can provide. It’s lightweight and small, so it’ll fit nicely into a pocket when necessary. It’s also sturdy and durable so you can add weight to a punch or swing it to smash the head of a bad guy. It’s non-toxic, hypoallergenic, and extremely durable. We highly recommend this option if you’re looking to expand your self-defense repertoire. Sometimes the best self-defense options need to give you a bit of reach. Metal tools and weapons don’t always give you this option. With a lead center, this weighted slapper gives you more reach than most keychain tools, but can still fit into a back pocket for carrying. There’s a spring coil in the handle to magnify the impact that can be caused with this device. You literally receive the protection that a baseball bat can provide, but with the convenience of something that is just 9 inches in length. Sorry – but this time, size doesn’t matter. This is a multi-function self-defense tool that gives you almost everything you could possibly need. Use it as a flashlight for those dark alleys. Take advantage of the tactical knife to have a bladed weapon. The high setting on the flashlight is 500 lumens, so flash it into the eyes of a bad guy and get away. It’s IP65 waterproof, has a hammer feature, and works as a good outdoor emergency tool or camping accessory. It’s rechargeable and comes with two outlets, including a car charger. This tactical flashlight also doubles as an emergency and self-defense tool. It has a window breaker on one end and has a serrated blade that works with the product too. The flashlight itself shines out to 300 meters and offers a 250 lumens bulb. It’s small enough to slip into a pocket, but sturdy enough to provide enough damage should it become necessary. Slip it into a backpack or pocket and you’ll be ready to take on whatever might come your way. The best self-defense weapons that aren’t guns will help you control the outcome of almost any situation. You don’t always have an option to retreat. Choose one of these tools and you’ll lower the risks of something bad happening to you.